← Books for Collier Kids joins the party! The League Club awarded 30 community agencies a total of $327,970 at its annual Briefcase Breakfast held earlier this month. With this year’s gifts, the club surpassed the $4.2 million mark of funds raised and contributed to 157 local agencies in Collier and Lee counties since it was founded. The League Club has an in-depth vetting process for all grant requests. Member teams do on-site visits to all agencies requesting monies for specific programs that meet the club’s funding priorities. The list is prioritized and the final candidates meet with the entire Community Involvement Committee for the last round of agency presentations. 2018 was a challenging year with the direct hit of Hurricane Irma. “The devastation suffered by thousands of residents who lost their homes to Irma and needed immediate help humbled us all,” club member Melissa McClayton said. “We were very privileged to have the resources to assist those in need by awarding a special $43,000 grant to the Collier Comes Together Disaster Relief Fund for those impacted by the disaster.” League members also volunteered many hours to assist Meals of Hope at three meal-packing events to help ease the effects of the hurricane on area food banks, she added. 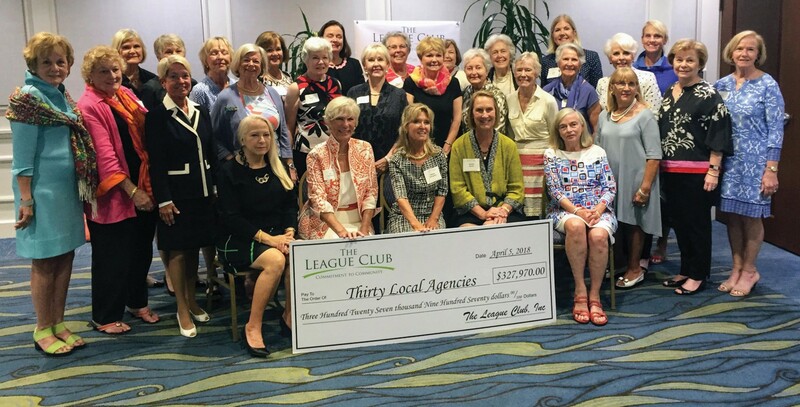 The League Club is an organization of women dedicated to strengthening communities through fellowship, education, volunteerism and philanthropy. Members are current or former members of The Association of Junior Leagues International.